In recent years, acid rain had a serious negative impact on the leaching behavior of industrial waste residue. Researches were mainly focused on the environmental hazards of heavy metal in the leachate, but ignored the effects of heavy metal speciation on the stability of waste residue in the subsequent stabilization process. In this study, the unstable calcium–arsenic compounds in the arsenic calcium residue were firstly removed by leaching process; subsequently, the crystallization agent was added to treat the remaining calcium–arsenic mixture. The results of the leaching process demonstrated that the decrease in particle size and pH value directly affected the increase in the cumulative leaching amount of arsenic, and the cumulative leaching ratio reached 1.55%. In addition, the concentration of arsenic decreased from 3583 to 49.1 mg L−1. 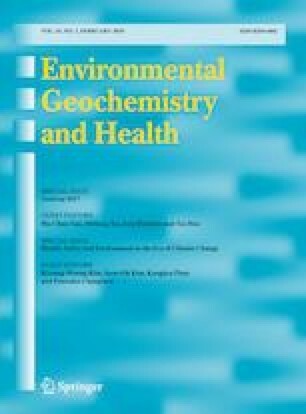 After the crystallization process, the arsenic concentration was lower than the limit value of Identification Standards for Hazardous Wastes (GB 5085.3-2007). The SEM analysis showed the bulk structures, and XRD pattern confirmed that they were the stable compounds. Moreover, the result of XRD and SEM illustrated that acid concentration, chloride ions and sulfate ions were contributed to the transformation and growth of stable calcium arsenate compounds. Therefore, effective control of the acidity of acid rain, the type of anions in acid rain, and the particle size of residues would contribute to adjusting the arsenic speciation to be more stable. The leaching-crystallization process was of great significance to improve the stability of the arsenic-containing residue. The online version of this article ( https://doi.org/10.1007/s10653-019-00273-y) contains supplementary material, which is available to authorized users. The authors gratefully acknowledge financial support from the key project of National Natural Science Foundation of China (51634010), Special Program on Environmental Protection for Public Welfare (201509050), the Natural Science Foundation of China (51474247 and 51704337), and Science and Technology Project of Hunan Province (2017RS3010).